Lucky Finds and Help Needed! I was lucky enough to stumble onto these two deals... The black one is fully functional and has Windows 7 loaded on it. The real find was the green one! It's the Chrome trim! I had to make quite a drive to get the green one but I'm happy I did. Now, it had "some" stuff inside but I actually plan to gut everything and use the green case as a custom build! 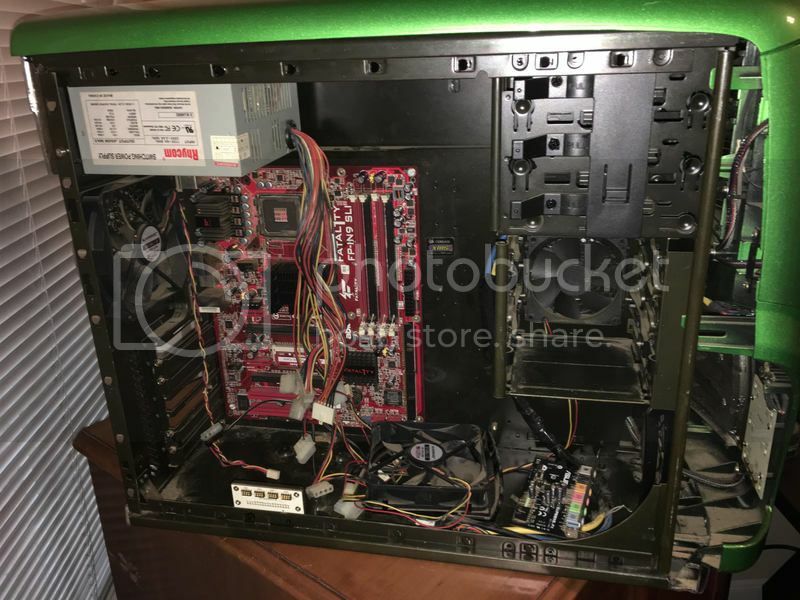 I need advice/help on what motherboards, coolers (preferably liquid if possible), videocards, etc could fit in this case. I want to make sure it's a smooth process and I don't have to deal with part returns and what not. Also, does anyone know what the green case is considered? The person I got the black one from sent me pictures of the initial spec/purchase sheet and it shows as a Area-51 R6. I'm curious if the green one is considered the same? Any different names for these cases? Great job on scoring those deals! I am always willing to drive but have also been known to pay sellers, even if items are listed as local pickup only. Sometimes, $50 of shipping is worthwhile. I also own both of the cases you just picked up, along with some older types. Both were released around the same time. The normal black case is most likely the predator/ Aurora line, whereas the chrome side might be the Predator 2.0, or Area 51 ALX. Normally, the cheaper cases have a silver inside, whereas the luxury systems had a green painted inside, with pre-installed sound-proofing foam. The case follows the normal ATX form factor, so almost any motherboard should fit. Your biggest worry may simply be graphics card length, and CPU cooler size. Also, note that these cases have top-mounted power supplies. Most PSU is made now for the bottom mount, so just make sure PSU you use can get good ventilation. I need to get to sleep, but feel free to reply for more advice. You can always PM, but I like open forum convo, so others can find this advice later if needed. Here's what's crazy... The Green one with the chrome has the green inside but no foam...the Black one is silver inside but has the foam on the panel. So for the motherboard I wouldn't have to stick to mini or smaller ones? Large ones can fit? Any tips for graphic cards lengths and cpu coolers? Also, where can I get more the black mounting brackets for hard drives? Or do I not really even need them? Hi! glad you are so excited! I also enjoy the case design and love my current build, which is posted on the overlock.net forums for viewing. 1: Depending on the year/ model, there are variations in the cases. If you really love any case, you can purchase acoustic foam cheaply, and interior painting is quite an easy task. The cases honestly have only as much value as you think they do. I recommend picking one case you prefer and using parts from the second to complete its' appearance. *** Save the other case, if you ever need to experiment with cutting through the metal, or plastic, for custom mods. 2: Both cases should accept medium atx board, which are standard. I have a medium atx board in mine. Of course, micro atx would work, and I feel like e-atx would fit as well. 3: The only limiting factor for GPU length is if they are going to hit something. I would need to see inside your case. My graphics card gets near the HDD cage, but there is still room between. My gtx 1080 (EVGA ftw) has a length of 267mm. 4: All missing pieces must be bought from other cheap cases on eBay, as scavenging. I did try having some plastic pieces 3d-printed, but actually had the seller steal the pieces, on his own pc! (Luckily, there is law enforcement). You only need enough brackets to hold the drives you want. You can always mount them in other unique spots, like the ODD area, using a bracket. I answered the questions as best as I could, but it really depends on what you wish to do. Some people just build in the case as-is, whereas other choose to restore the case, and even add new paint, or do other fun mods. Let me know if you need any assistance. I know which tools can cut the case well, and even have a wiring guide if you need to troubleshoot the built-in LED. 1. I didn't know about the acoustic foam, that's cool. I will look into getting it for the Green case. I actually plan to keep and use both cases! I doubt I'll do any cutting and what not, but if I *needed* to I'd try them on the black one first. 2. Okay cool, looks like I have a lot of motherboard options then! 3. If you can get a 1080 in it, then I should have zero problems doing what I wanted. My current two desktops and all of my laptops are NVIDIA/Intel builds..I wanted to do an ATI/Radeon build with the green one. I was looking at maybe getting an RX 580 to put in it. I just plan for 1080p gaming on it, as I already have my Area 51 R2 with 1080s in SLI for 4K gaming. I'm been trying to decide on what the best 1080p Radeon card would be..leaning towards the RX 580 but am open to suggestions! 4. I feard that might be the situation, cases aren't cheap and are hard to find. But I will make it work without the extra mounting brackets! Green case and is the same size as mine! Good luck, and feel free to message if any help is needed. 3 amd 470/480/570/580 are way higher priced, due to mining popularity. May be better getting a card not used for mining. 4 Good luck. I use velcro and glue, to mount solid state drives behind case. I’m sure I’ll have questions and will take you up on the offer! 3. I’ve seen some 580s for like $280-$300 guessing that’s too much? Do you have any other recommendations for any Radeon cards then? 4. Not a bad idea, I’ll see what’s up once I start on the build. most amd cards are high priced due to mining. Right now, nvidia cards are an okay price, such as 1080, 1070, and 1070 ti. Still, the newer AMD vega cards may be a good choice. Do you have a budget for GPU? The Vega 56 actually doesn’t look too bad. Seems to be a pretty big performance jump from the 580, too... I might go the route of the Vega 56, instead of trying to get two 580s or even a single 580. EDIT: I’m honestly still torn. The Vega 56 is like twice the price in a lot of cases. I may start with a RX580 and if I want to upgrade to the Vega a few months down the line I can put the RX 580 in a different build. Getting the 580 lets me do better stuff elsewhere. I actually ended up lucking up and finding an MSI RX 580 8GB version for $229, new on New EGG. So, I just got that. The question above about the motherboard still stands, that and the processor are definitely tempting! Good price 580, way better than mining inflated $270ish normally. That is good cpu combo, but you could maybe get a cheaper motherboard. depends on your mobo needs. Board should fit though. Yeah, when I saw that deal on the card I jumped on it. I haven’t built in years... if you have any MOBO suggestions for use with a Ryzen Processor, I’m open to them. I don’t want to skimp on quality but I’m always about a good deal. I normally buy ASrock boards, as they are less gimmicky, and more power-user oriented. While they still have some led, they will have less of the gaming internet, and other BS lol. I must head to bed now lol. Good luck. You can always google best ryzen board, or search most popular on newegg. MSI and aorus are good brands too. Asus has been know to have bad customer support recently, so I tend to avoid them. I actually really like this one. I spent hours last night and more today researching the boards by that (and other brands) and that fits all of my needs (I also like that it has the built in wifi). I'm also leaning more towards the 1800X now instead of the 1700x processor. I'll decide more over the next few days but you've been a massive help! If I have any questions I'll let you know, otherwise I'll post once I've figured all of the parts out and post progress. From what I’ve found the 1900X offers little performance gain for a lot more price, it’s more PCI Lanes than anything. I’m going to stick with the 1800X. Now, I still think making the drive to get it may end up being cheaper for me, as they have a deal on the 1800X and the motherboard I want too. Just a matter of getting over there or paying a little more to get it online lol. I’m trying to decide which ram to get at this point, debating on Corsair as I love their stuff... but I’m considering getting a different brand since I always default you Corsair, this build is about trying new things! Yeah, I definitely thought about using that as a intro to it.. However, I should note next year I may be doing a separate build in a different Alienware case (it's being delivered soon, I'll update once it's here)...Soooo, that option might be better next year, maybe when things are cheaper. For now, I'm going with the 1800X for sure. Also, this build will have that RX 580 but I may either add a second RX 580 to it if I have enough after the build is done..or in a few months when I have the funds add the second one or even upgrade to the Vega 56 and use this card in a different build or sell it. Yeah, since the motherboard supports the 3200, I'm definitely going to check it out..I've never seen speeds that fast on my PCs...I have 2133 on my Area 51 R2 and 15 R2 and 1866 on my Aurora R4. I'm anxious to have memory speeds that high. I'll look into G.Skill and see what I think! I'm actually about to browse around for that and power supplies now. Case Fan question for you two... thw front fan and the side fan (inside the HDD Bay area) what size are those fans? I'm obviously wanting to get new fans and need the size. I'm not worried about the back one because obviously I'll be using a liquid cooler that had the fan already on it (likely using the original one from my Area 51 R2).